By Eli Pariser, The Penguin Press, 2011, 308 pages. Eli Pariser is the board president and former executive director of the liberal website MoveOn.org, which at five million members is one of the largest citizens’ organizations in American politics. He has written op-eds for The Washington Post and The Wall Street Journal and has appeared on The Colbert Report, Good Morning America, Fresh Air, and World News Tonight. Personalization is an algorithm that filters knowledge about you to adapt your view of the information on the Internet. Amazon uses knowledge about the books you purchase to suggest other books that may interest you. YouTube and Netflix do something similar with videos. In fact, personalization is a core strategy of every major website. Pariser’s goal in researching his book was to answer some important questions about personalization: How does it work? What is driving it? Where is it headed? What will it do to us? And how will it change our lives? What he discovered is the filter bubble. The amount of information on the Internet is overwhelming. Many users model the Internet as either a large department store or a huge reference library, and personalized filters make it manageable. Most of us like not having to laboriously sort through all the content ourselves. Of course there is another side to personalization: advertising. By collecting information about demographics, preferences, purchase history, and clicks, companies can target their ads directly to likely buyers. To most users, that seems a reasonable trade-off. But every click becomes a commodity. Highly profitable personal data companies have accumulated an average of 1,500 pieces of data on 96 percent of Americans to auction to the highest bidder. Among the data is the names of your family members, your current and past addresses, your politics and religion, how often you pay your credit card bills, whether you own a dog or cat, whether you are right-handed or left-handed, and what kinds of medication you use. What concerns Pariser is that when personalization based on such comprehensive data is used to filter your searches you get a biased window on information. He asked two friends to Google for “BP” soon after the Deepwater Horizon oil spill in the Gulf of Mexico. They were presented fundamentally different results — one with news about the spill, the other with investor data about the company. Personalization has created a bubble using its knowledge of you that you can neither control nor easily escape. Pariser examines the extent of the filter bubble with many examples. He extrapolates the effect of the bubble extending to news sites that show you only the news that appeals to you, filtering out something you really might want to read. He’s concerned about how personalization can influence your political thought by filtering out discourse with those of differing views — a fundamental tenant of democracy. And, unchecked, he sees an increase in discrimination and a decrease in well-informed people. Pariser says, “Your identity shapes your media, and your media then shapes what you believe and what you care about.” He calls this a you loop, being influenced extensively by your own ideas. His Ted Talk provides a quick and accessible summary of his ideas. Pariser attempts to propose solutions to the problems he sees, ranging from individuals regularly erasing their browser history and cookies, to self-regulating companies, to government regulation. Eli Pariser’s research is well done and his interpretation and conclusions are reasonable, although he glosses over the implications of this data mining for privacy. The book is engaging and thought provoking. 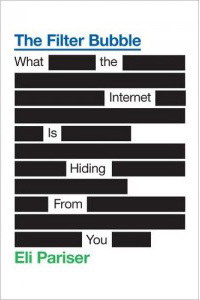 I recommend it to anyone interested in the future and ethics of technology, He is planning a sequel, due in April, The Filter Bubble: How the New Personalized Web Is Changing What We Read and How We Think.